Have you thought of starting a business? Chances are you’ve picked up a help book somewhere along the line, you’ll recognise the type… “Business for Dummies”, “The Entrepreneur’s Manual”, “The Salesman’s Bible”, that sort of thing. 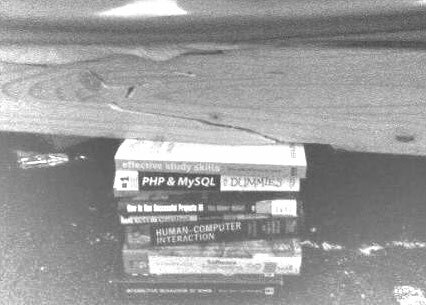 Now, if you’ve gone the whole hog and actually started a company, these books are probably languishing in a dusty corner of the house. Their usefulness confined to those times when this precise thought floats through your mind: “you know what, that’ll do”. Whilst I’m rather proud of my engineering ingenuity, I can’t help but feel that the authors would be somewhat aggrieved to see their “masterpieces” propping up the side of a collapsed bed frame, not inspiring the masses to success and riches. Although I hasten to add this is not their only use. Can’t reach the light fitting in the ceiling to change a bulb? Don’t worry! A carefully arranged pile of unloved business manuals can make an excellent impromptu step ladder (although I would recommend hard backs). You’re probably wondering, quite fairly, “that’s all very well but what’s that got to do with the price of fish?” Well, in the process of wedging the sixth or seventh successive book in the gap between the frame and floor, I picked up said book and glanced through it. I was struck with an immediate realization; it is all too easy to forget the guiding principles and good intentions we harbored when going into business. Unfortunately, the daily grind and harsh realities of owning a business often eclipse the reason the company was founded in the first place. Paying the bills will always take precedence over any lofty idealisms. One thing is for sure, books of the same ilk, such as the “Guide for Start Ups,” are not going to make you a millionaire. Only hard work, perseverance and conviction will do that. However, it doesn’t hurt to tap into a bit of idealism every once in a while. – Laszlo Bock, Senior Vice President of People Operations, Google. Surround yourself with good people and don’t mistake cleverness as an indicator of that. Until universities offer degrees in ‘Good ideas, enthusiasm and hard work’ a person’s qualifications will only be as good to your business. Don’t let yourself get bogged down by challenges. Instead, use the tools at your disposal to enable you to take on those challenges. CorePM adopts this as a driving philosophy; in the project management arena, projects CAN be managed in a simple and efficient manner. Don’t over complicate things that shouldn’t be!